This collaborative project between the University of Bath, University of Brighton, UniLaSalle in Rouen (France) is investigating the performance of a range of waste materials and bio-based co-products as alternative building insulation materials. 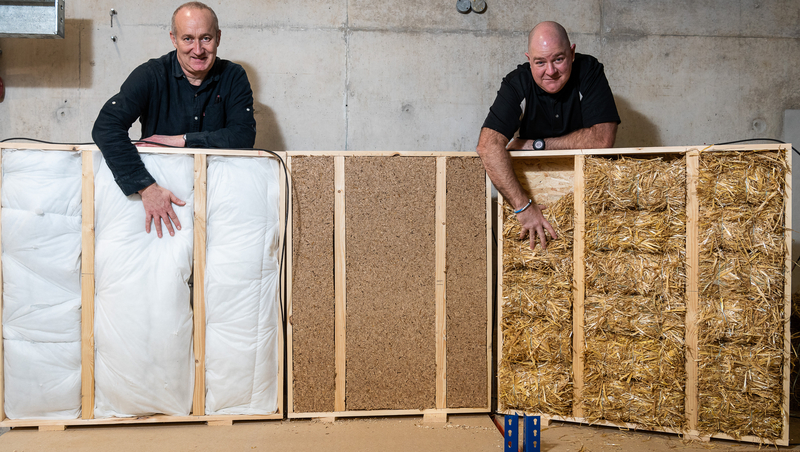 Three different materials are being evaluated – wheat straw bales, rapeseed stalks (processed into bio-composite), and recycled duvets. If their thermal performance is comparable or better than current insulation, industry will think seriously about using the materials in future construction. A research team at the University of Bath is testing and comparing the thermal performance of each of the insulation materials by constructing three identical prototype wall panels, each containing one of the materials. Their performances will be compared and contrasted with each other as well as against industry standard insulation used currently in most buildings. It is hoped that by using already existing waste materials or co-products, widespread use of such materials in the construction sector could lead to significant reductions in emissions associated with construction as well as reducing the dependency on natural resources used in traditional insulation such as glass wool and rock wool. The panels are 150mm thick by 1.1 metre square and fitted with 9mm plywood either side, similar of how insulation is commonly constructed into buildings. Each panel contains a number of probes measuring relative humidity, interior and exterior temperature, and heat flux. The panels will undergo six weeks of consecutive rigorous testing in a state-of-the-art environmental chamber at the University’s Building Research Park. There will be two tests – a steady state and a non-steady state temperature test. In the first test an increasing temperature will be applied to one side of the panels to calculate how much energy is required to increase the temperature on the other side of the panel. The second test will involve increasing the humidity to evaluate how each material maintains and holds moisture. Research Associate in the University of Bath’s Department of Architecture & Civil Engineering, Dr Shawn Platt, said “This is the first time these materials will have been tested in such a robust scientific way allowing us to accurately assess their thermal performance against each other as well as against industry standard insulation”. 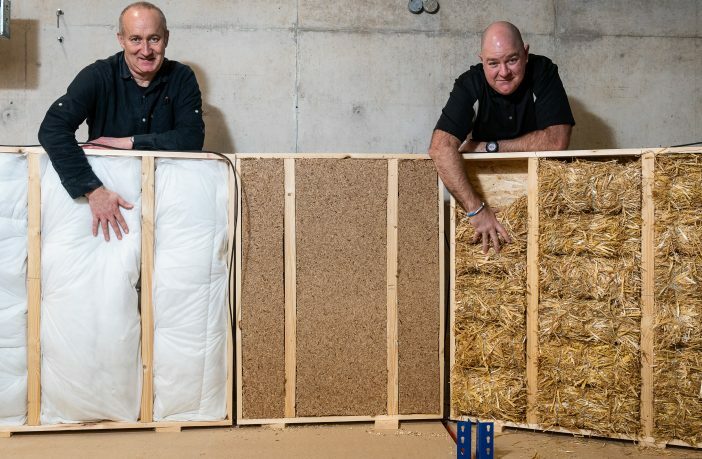 Professor of Innovative Construction Materials at the University of Bath, Pete Walker, commented “Our previous research has shown the performance of straw bales as a sustainable and energy efficient building material; however, there are a number of other waste and co-products which could also perform well as construction materials. The opportunity to exploit these waste and agricultural co-products is not something that should be ignored and we are hopeful that if their thermal performance is comparable or better than current insulation, industry will think seriously about using the materials in future construction”.